Promising athlete Lee Thompson ran a personal best in the 400 metres at the British Indoor Championships in Sheffield. A time of 47.87 seconds in Sunday’s final saw him finish fourth in the race but a disqualification meant he was third and a bronze medal winner. Thompson, 19, a former Outwood Academy Portland student, has represented Great Britain and England under-20s in both the relays and individual races. 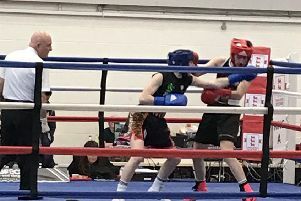 He has been Northern Champion for the past two years and finished third in his age group at the national championships in Bedford last year. Not bad for someone who only took up running two years ago. “He played football for a number of years and then one of his PE teachers mentioned he should try running,” said mum Sally. “He gave it a go and hasn’t looked back. “He works full time and is studying for a qualification in his job as well. So there’s plenty to do as well as training four times a week and the gym. Thompson, who works at Wilkinsons head office, clocks his outdoor PB at 47.32s and he has finished the last two seasons ranked third in the UK for U20s at 400m. He was also awarded Seior Sportsman for Bassetlaw in December and was awarded funding from Notts County Council through the Talented Athlete Scheme in October.